If your health and fitness business is looking for a better bottom line, there are two things you need to focus on: sales and expenses. More specifically, you need to increase your sales, reduce your expenses or, in an ideal scenario, successfully accomplish both of these goals. While boosting your profits is often a case of “easier said than done”, there are a number of valuable strategies for maximizing revenues in the health and fitness industry that your business could be benefitting from. Industry studies show that with disposable income growing in the US, and baby boomers continuing to rail against aging, spending on fitness and related services is set to rise. This is a great time to take advantage of this trend by implementing a plan to achieve the twin objectives of ramping up income, and cutting costs. Adding programs or services that are significantly different from what you already offer is a great way to keep your business fresh, and encourage your customers to spend. If you’re a yoga studio with a great group class reputation, consider adding a certified training course to your program line-up. Fitness clubs can benefit from strategies like offering a monthly massage package, or an add-on membership that allows the use of specialized equipment or workout areas. 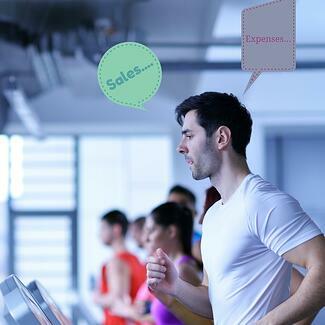 Any health and fitness business can encourage more cross-selling and up-selling by simply adding relevant products for purchase to their service line-up, promoting crossover services where appropriate, or offering enhanced packages and memberships that include individual training or specialized workshops. Inc.com has a really great article regarding referral systems that work. When you encourage cooperation with other local businesses in the health and fitness industry, you can benefit from a win-win approach to growing your client base. Companies that are not in direct competition with your own will generally be only too happy to consider the mutual promotion that can be achieved by referring their yoga clients to your massage therapy clinic, and vice versa. When it comes to referrals, don’t hesitate to make the most of any opportunity to bring in new clients through your current ones. Social media makes it clear how much people love to share their experiences. Not only should you always take steps to ensure that the news being shared is positive, if you don’t already have an incentive program for personal referrals, you should consider starting one as soon as possible. A key area for cost savings that’s often overlooked by many small business owners is the timely collection of customer receivables. Remember that carrying overdue amounts owing to your business translates into a cost, and that profits can’t be realized until services billed are actually paid for. Your company should have an organized system for dealing with unpaid bills that includes regular follow-up on delinquent accounts, and the use of a professional collection agency, when it’s called for. Offloading business activities that can be accomplished more efficiently by others is another effective way to reduce your expenses. For example, hiring an outsourced bookkeeper for your health or fitness business allows you to save money on payroll costs, as well as valuable time that could be better used researching, designing and implementing those crucial revenue strategies.